Yahoo! in China: Lessons for all of us, everywhere. I've written an article for this month's Far Eastern Economic Review titled Asia's Fight for Web Rights. It takes a look at how Yahoo! went from assisting in the imprisonment of four dissidents in 2003 and 2004, to being yelled at in Congress in 2006 and 2007, to Jerry Yang's apology and recent establishment of a human rights fund administered by human rights activist Harry Wu. The article also examines how at least some other companies are trying to learn from Yahoo! 's early mistakes. 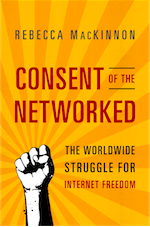 It explores the different approaches and disagreements over how (or whether) Internet and telecommunications companies are capable of respecting their users' rights to free expression and privacy in markets like China - or in any market for that matter. Meanwhile, the rest of us should not simply sit around and wait for our Internet and email service providers, Web-hosting services, and mobile-phone carriers to do the right thing on their own. Technology users around the world have an interest in joining together to insist that the products and services with which we increasingly entrust our careers, our beliefs and the most intimate parts of our lives, will not sell us out because they feel they have “no choice” since all their competitors are selling out their users too. Click here to read the full article. Feel free to leave your reactions in their comments section. Also be sure to check out the award-winning article by my colleague David Bandurski, Pulling the Strings of China's Internet, from the December 2007 issue. Now free online. "Contrary to media reports, Yahoo! Inc. is not displaying images on its web sites of individuals wanted by Chinese authorities in connection with the recent unrest in Tibet," it said in a statement sent to AFP in Paris. "We are looking into this matter with Alibaba Group, the company that controls China Yahoo!," the company said. Are they implying that France24 fabricated the screenshots then? I suppose they are technically correct by saying "is not displaying" - since by the time Yahoo! p.r. made the statement, the item was in fact no longer there. Still, you'd think that Yahoo! - after all they've been through with the Shi Tao case - would know better than to issue such stupid p.r. statements, setting themselves up for more grief and accusations of dishonesty as more facts emerge. Well, who is Yahoo! China going to please here? On one hand, there are their corporate masters located in the United States who evaluate the public relations implications of their actions and this may have been the decision here to avoid yet another Congressional hearing. On the other hand, it will be hell to pay in China if word gets out that Yahoo! China will not assist in chasing down the criminals who perpetrate the criminal acts that have been broadly publicized around the world because of the fear of bad publicity in America. SAN FRANCISCO (Reuters) - China's Alibaba Group is seeking investors to buy the 39 percent stake in the Internet company held by Yahoo Inc, a person with direct knowledge of the situation said on Tuesday, outlining a plan that could stop Microsoft Corp from getting the Alibaba stock. Alibaba's move indicates it thinks Microsoft is likely to win its $42.4 billion bid to buy Yahoo, in which case the Chinese company would prefer increased independence, the person said. The source did not want to be identified because of the sensitivities surrounding the discussions. Maybe they're looking for investors who are less worried about being yelled at in congress and condemned by human rights groups? Roland is right, Yahoo! China and MSN and all the other foreign-branded web businesses in China are caught between a rock and a hard spot in times of crisis such as the Tibet riots. There will be more such tight spots to come. In China, the Internet portals are not allowed to run original news reporting and are required to run news reports from a set of approved sources. That means that on any given story, you aren't going to get any news on any major story that the government didn't want disseminated. These portals receive feeds from approved news sources which they republish without editors giving too much thought to the "news angle" being portrayed, because it's the only angle available. During normal times, this is just a fact of life and is not particularly remarked upon. In times of crisis, when China and the West see things very differently, it becomes much more problematic. Since there's no way to run a web portal without following the rules about news sources, either you follow the rules or you don't bother doing business. Just think: what if Yahoo! China and MSN China had been around in 1989 for the June 4th crackdown? Could they have refused to run the government's version of events on their portals - and the most-wanted lists of student protesters - without losing their licenses? How would the West have reacted if the companies had gone along with Chinese government requirements? Western companies with web businesses in China and those who invest in the whole sector should think through what they will do if something even worse than the Tibet riots happens - something on which China and the West are equally divided over who the good guys and the bad guys are. Because more things like this will happen. And these companies will be accused of aiding the "bad guys" by people back home. What then? For those who cannot read Chinese it is interesting to note that the top headline on Yahoo! 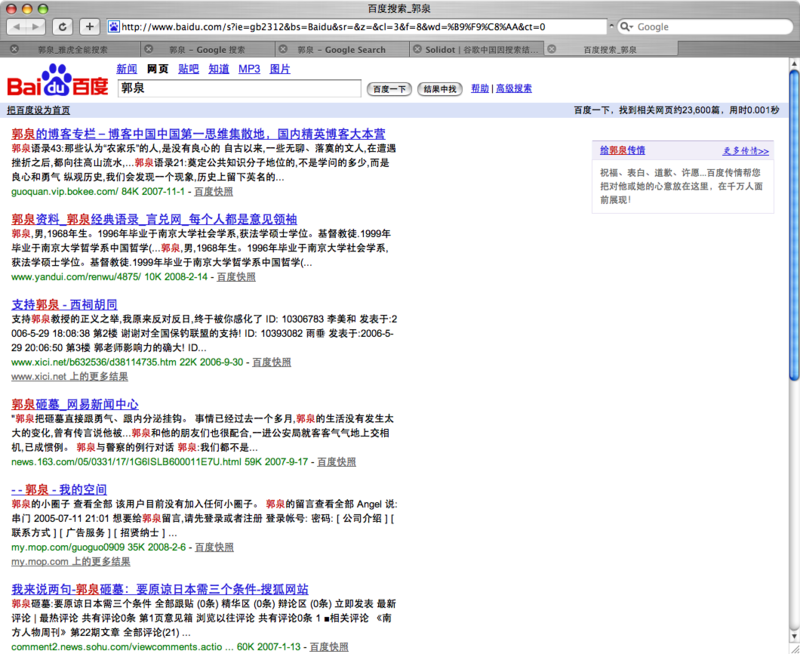 China's home page reads: 568名暴力事件受害群众获救助, or "568 victims of the violent incident receive aid and assistance." Click through that story (from the official Xinhua news agency) and scroll down to the bottom for more stories that Yahoo! China is running on the Tibet unrest. All are from the Xinhua news agency or other similarly government-sanctioned sources and include titles like "The truth about the March 14th Lhasa riots" and "Some national governments support China's legal handling of the criminal violent incident in Lhasa." It is also important to note that many Chinese portals like Sina.com have a lot more special coverage content about the riots, with headline stories denouncing the Dalai Lama, and much more in-depth content (favoring the Chinese point of view) about the whole situation than Yahoo! China has. But the problem Yahoo! China faces is that they are stuck with no other choice than to run relatively light coverage on the country's biggest national news story, because to cover it heavily would require using government-sanctioned content only, which puts them in the position of "taking sides," as it were. It makes me really glad I'm not in charge of a foreign-invested or foreign-branded web business in China that has anything remotely to do with news. I'm actually starting to think that over the long run it may turn out to be impossible for multinationals to run commercially successful local news and user-generated content portals in local markets other than their home markets, plus markets that are politically similar or sufficiently aligned to the home country geopolitically. If you're in a market whose geopolitical interests and world view are vastly different from the home market, I don't see how you avoid this kind of "lose-lose" situation in inevitable times of crisis. In closing I'd like to respond to a commenter who accused me of "siding with rioters." I don't believe I ever did that. For a person to kill and injure other human beings who haven't directly endangered one's own life is always wrong. The rioters who committed violent acts have sadly discredited their movement (which has never been unified in its goals and tactics, anyway, which in addition to PRC thuggishness is another reason why it hasn't gotten much of anywhere). Is the Chinese government going to handle the aftermath with sensitivity and fairness? I've seen little precedent for it. If the Chinese government wants to prove it can sort things out with sensitivity and fairness they shouldn't have kicked out the foreign media. Do I think that the Chinese government is manipulating information? Yes, because from my long experience living in China, they always have. Do I think a lot of the Western media are over-simplifying the situation, playing to their audiences' desire for a "freedom fighters vs. communist thugs" story line and getting lots of facts wrong? Also yes. Do I think that the Chinese government's treatment of Tibet created genuine anger which made an eventual violent outburst likely if not inevitable? Yes again. Do I think that the Tibetan people's lives would be better off if outside powers were to support a civil war of independence? No. Do I think that the Tibetan people's lives (and the lives of many other ethnicities who now live in Tibet) would be better off if China granted independence to Tibet tomorrow? It's questionable. Would Tibet be free of human rights problems if it became independent tomorrow? I don't think so either. That's why the Dalai Lama advocated some kind of negotiated autonomy instead of independence as the only realistic solution at this point. The riots have likely killed that possibility. But to say the Chinese government is blameless because ethnic Tibetans committed deplorable violence last week is just as naive as to claim that the Tibetan rioters were heroes. More Chinese dissidents sue Yahoo! Last week, in response to an appeal by Jerry Yang, Condoleezza Rice raised the cases of Wang Xiaoning and Shi Tao with Chinese authorities on her visit to Beijing. A Chinese version of Jerry Yang's letter to Rice is circulating around the internet. It's unclear whether Rice's intervention will result in an early release for the two men. But in the past, getting one's case raised by the U.S. Secretary of State has tended to boost a person's chances of early release. The Chinese have also agreed to resume a stalled human rights dialogue. This is no doubt tied to concerns about international criticisms in the run-up to the Olympics. Another development that surfaced in the English-language media on Thursday and Friday this past week is a new lawsuit against Yahoo!. It was filed on February 21st in San Francisco by two men, Guo Quan, a Nanjing-based scholar and acting chairman of the underground New People's Party, and Zheng Cunzhu, head of the Western U.S. branch of the Democratic Party of China. According to Zheng who gave a press conference in Los Angeles on the 21st, the previous lawsuit against Yahoo! resulted in a secret settlement with the relatives of Wang Xiaoning and Shi Tao. However that lawsuit, Zheng says, claimed to include over 60 people who had been harmed by Yahoo! 's disclosure of personal e-mail information to Chinese authorities. These people included China Democratic Party Li Zhi, who is now serving an 8-year sentence. See Zheng's open letter to Jerry Yang in Chinese for more details about the reasons behind the lawsuit. For more Chinese-language reports on the lawsuit click here, here, and here. Note that some of the English-language reports about this case have gotten facts wrong. A Computerworld story picked up by the Washington post erroneously reports that Guo Quan's part in the lawsuit relates to the handover of e-mail records. However the more detailed Chinese reports on the case make it clear that he is suing because search results about him were removed, and that this has an adverse impact on his business. Businessweek got the story right - also pointing out that Li Zhi (doing 8 years in prison thanks at least in part to a Yahoo! e-mail handover) is not a plaintiff, while the Computerworld story (amplified by the Washington Post) says Li Zhi is a plaintiff. Ars Technica has a more well-informed and detailed version of the story which are consistent with the Chinese reports I've seen - plus some decent analysis. About Guo Quan: One thing that the English reports over the past few days haven't mentioned is that Guo Quan recently announced the founding of the Chinese Netizens' Party. In January he launched the New People's Party, which caused him to lose his teaching job. He is a historian known for his work on the Nanjing Massacre. Jane Macartney interviewed him for a Times of London story in early February. At the time he was threatening to sue Google in addition to Yahoo! for removing his name from search results on Google.cn. However, Google soon resolved the problem and you now get results when you do a search on his name - though any dissident overseas websites mentioning his name don't appear in those results while they do appear in a Google.com search. Meanwhile, as of this writing you still get nothing when you search Guo Quan's name on Yahoo! China. Ironically, even Baidu does actually return results. Yahoo wasn't necessarily any worse than Google or Microsoft; Yahoo was just the first to have been publicly caught in the moral quagmire that U.S. companies face when dealing with repressive governments. It's unfortunate that several men were arrested and thrown behind bars before Yahoo changed its mind. Actually, that's wrong. Yahoo was much worse. 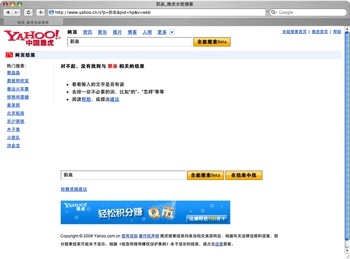 Neither Google nor Microsoft set up local Chinese-language e-mail services with the user data sitting on computer servers inside the People's Republic of China, under PRC legal jurisdiction. Gmail and Hotmail data are not subject to Chinese police order the way Yahoo! Chinese e-mail is. Google and Microsoft have said in public statements that the reason why they're not doing e-mail in China is to avoid being complicit in sending dissidents to jail. Also, as I found out when doing test searches for Human Rights Watch in 2006, Yahoo! Chinese search censors much more heavily than Google and MSN - and as we can see from the Guo Quan case, sometimes they even censor more heavily than Baidu! For everything I've ever written about the Yahoo! China cases click here. Human Rights in China has launched a new campaign for the new year titled "Incorporating Responsibility 2008." Each month they're focusing on the case of a different person "who has been imprisoned for exercising his or her human rights." Shi Tao (b.1968), a journalist, headed the news division at the Dangdai Shangbao (Contemporary Business News) in Changsha, Hunan Province prior to his arrest. On April 20, 2004, Shi attended a staff meeting where a Chinese Communist Party Central Propaganda Bureau document about security and preparation for the fifteenth anniversary of the June 4 crackdown was discussed. That evening, Shi reportedly used his personal Yahoo! e-mail account to send notes about this meeting to the New York-based website, Democracy Forum. Shi was detained on November 24, 2004. On April 27, 2005, he was sentenced to ten years in prison for illegally providing state secrets overseas. He is currently held at Deshan Prison and is due for release in 2014. For more information, please see http://www.ir2008.org. The WAN Board believes the end of 'business as usual' in China is necessary to effect belated and needed reform, and it encourages all partners in the Games, and all companies doing business with China, to speak out about China's human rights abuses," said the resolution, part of a global campaign by WAN to draw attention to Chinese press abuses and help free jailed journalists in the run-up to the 2008 Summer Olympics in Beijing. By all accounts, the Beijing Games are shaping up to be a showcase for China. But these events should not be allowed to take place without active opposition by participants -- the IOC, athletes, sponsors, media partners and others -- to the repressive conditions that surround the Games. Turning a blind eye to these violations of human rights would be a scandal. Urging the provision of immediate and appropriate medical treatment for Shi Tao's deteriorating health; and treatment of Shi and all other prisoners in a manner consistent with the People's Republic of China (PRC) Prison Law and numerous international standards. Last month I gave an presentation titled "Shi Tao, Yahoo!, and the lessons for corporate social responsibility" at the International Conference on Information Technology and Social Responsibility held at the Chinese University of Hong Kong. The presentation is based on a long paper - which is actually a modified draft book chapter. A revised version of it can be downloaded here (PDF 523.4K). The paper attempts to document somewhat definitively all the main developments and issues surrounding the Shi Tao case, Yahoo! 's role in it, the impact that the case has had on the global debate over corporate social responsibility, and explores questions about where we go from here. It's still very much a draft, so I welcome comments, corrections, and criticisms. My main argument is that the Shi Tao case highlights the complex challenges of corporate social responsibility for Internet and telecommunications companies: They are caught between demands of governments on one hand and rights of users on the other – not only in authoritarian countries such as China but in virtually all countries around the world. While Yahoo! may have been legally "off the hook" as far as Chinese and perhaps even U.S. law was concerned, it is not off the hook in the court of global public opinion. Moral imperatives aside, the Shi Tao case proves that Internet and telecoms companies seeking to establish trustworthy reputations across a global customer base cannot afford to ignore the human rights implications of their business practices. Customers and investors need to leverage this reality and demand that user rights be respected. I conclude that if we cannot count on the private sector to respect user rights, the need to develop non-commercial, grassroots alternatives will become all the more critical. Hong Kong's first Barcamp - a great success! i found myself surrounded by people in firefox, linux and all kinds of web 2.0 shirts; people handing out moo cards, showing off their flickr/cc stickers, giving interactive sessions on ajax, facebook, open social, desktop apps, digital printing, web service scalability...whatever you can think of. free coffee, cookies, chips and sandwiches were provided. it's surprising to see so many talented and generous people in HK who came here to share their love. or just to learn...like why i was there. It seems to me that almost 40% were developers, 30% were from business organizations (project manager, start up owner), 10% were from NGOs and 20% were unknown (maybe bloggers just like me?). This is just my wide guess, I am sure that someone could give me a better answer. In terms of nationality, 70% were HongKongers and 30% were Foreigner. However there must be Singaporean because I heard the accent. Language used during the presentations were English while I heard that offline discussions were mostly in Cantonese. In keeping with the global Barcamp tradition, Saturday's meeting was run as an "unconference": No pre-organized panels or keynotes or invited lectures. First thing in the morning, participants are greeted by a whiteboard indicating timeslots and rooms. Anybody who wants to lead a discussion or give an impromptu presentation writes their subject on a post-it note and sticks it on the board. Similar topics are combined and consolidated, then away we go. With the mix of people we had, the result was a really nice mix of technical sessions, sessions about business, and more philosophical discussions. I learned a lot from many people about the web startup scene in Hong Kong, the mobile web, online communities, search engine optimization, and many other things. But like most conferences the most important part was getting to know a great group of people, sitting around talking in the halls and sharing all kinds of ideas. Since the meeting was hosted by Yahoo! Hong Kong, I felt compelled to lead a discussion on "user rights," the lessons all of us should learn from the Shi Tao case, and how should the web community constructively proceed if we care about protecting users' rights to privacy and free expression? (For the record the local Yahoo! folk were good sports about it.) It was exciting to see how many people came to the session and showed that they care about building responsible web businesses. There was an especially thought provoking discussion about where to host user data. One person said you should just host all user data in the U.S. so that governments like the Chinese government can't get at it. Others questioned whether this is a cop out for local businesses especially: shouldn't local companies push to maintain and defend spaces where the rights of users can be protected in their home jurisdictions? Don't they owe that to their users? There was also the question of whether users from here or anywhere else can really count on the U.S. government in the long run anyway - or any government for that matter if nobody is pushing back. Several people who work in web startups said they would really like to see common guidelines developed for the industry about how to deal with governments that pressure them to control user speech or make unreasonable user data demands. We also raised the need to do a better job at informing the public about how e-mail and user content-sharing services work, and with whom their data is shared. Several people said they hope to see more discussions like this in the Hong Kong web community. In response to that interest, I set up a follow-on wiki page here where you can find out more and sign up on a "Hong Kong user rights" google group. Interested in getting involved with Hong Kong's next Barcamp, or in learning more about what happened on Saturday? Check out the BarCamp HongKong wiki page and Facebook Group. Also, for anybody who may be interested, I'll be presenting a paper titled "Yahoo!, Shi Tao, and the Lessons for Corporate Social Responsibility" on Tuesday at the International Conference on Technology and Social Responsibility being held at the Chinese University of Hong Kong. I will put the paper online when it's ready for public viewing. I've been so busy talking to journalists about this in between helping my students cover Hong Kong's district council elections, I haven't had a chance to write about the news that Yahoo! has settled the lawsuit against them by relatives of Shi Tao and Wang Xiaoning, two of the dissidents sitting in jail thanks in part to Yahoo! 's cooperation with the Chinese authorities. I won't repeat all the facts that everybody is reporting. Just a few quick thoughts. Yahoo! has definitely evolved over the past two years since Shi Tao was sentenced. They started out on the defensive, with statements that sounded as if they believed that Shi Tao, dissident Wang Xiaoning and at least two other people were acceptable collateral damage in the noble effort to bring the Internet to China. After being featured as number one negative example on the cover of at least two human rights reports, yelled at in congress twice, a victims' lawsuit, and countless anti-Yahoo campaigns by free speech and human rights groups, they are finally doing what many have been advising them to do for some time: admit that their actions have helped to ruin human lives, and admit that they made mistakes. It is unfortunate that it has taken two years for their executives to meet with the family members of Shi Tao and Wang Xiaoning, offer to help them financially and legally, commit to helping them get out of jail, and commit to serious efforts to prevent such situations from happening again. Yahoo! spent two years digging themselves into a hole of mistrust and lost good will which one settlement alone won't fill in. But it's definitely a start. I hope Yahoo! and all Internet companies have learned something from this: that they've got to think through the privacy and human rights implications of their international business decisions before they launch new services in any market. Or they will pay later. And there will be broader implications for global free speech and the future of global information flows. The Internet could get so balkanized as a result of short-term business decisions that it loses much of its long-term value. The suppression of online information is fast becoming a crucial political question, with China now the world's second largest country on the internet population, and expected to overtake America within just a few years. As a result of such growth and success, Beijing is now setting the standard for dozens of countries around the world who are following suit and heavily censoring the internet - Saudi Arabia, Iran, Vietnam, Syria, and (as we saw recently) Burma. What happens to the web when its most powerful group of users live under a regime that keeps them blinkered? Somebody needs to take a stand. But if Silicon Valley's finest are happy to pocket profits from repression, and China's internet elite are unable or unwilling to help, who will fight for us? ... it is ultimately shortsighted to single out Yahoo for the kind of behavior now common to many big U.S. companies operating in China. That's why we need to have a much bigger discussion about how to engage economically and politically with China. It's also why the proposed Global Online Freedom Act, which would make it unlawful for U.S. companies to filter Internet search results or turn over user information, should not be viewed as a magic bullet but rather as the start of that debate. But Congress was hardly in a position to cast stones at Yahoo. Our lawmakers have systematically undermined Americans’ civil rights over the past few years. Thanks to the laws passed in the wake of the 9/11 terrorist attacks, the Bush Administration can pretty much ask for — and get — any information it wants on anybody. It can hold people without charges. And it can use torture techniques such as waterboarding with impunity. If Congress really cares about protecting people’s Internet privacy, how about stopping AT&T and other phone companies from turning over Americans’ phone and Internet records without a court order? The AT&T case is far more egregious than the Yahoo one: essentially, the phone giant gave the National Security Agency a giant wiretap on all U.S. Internet traffic — no explanation or justification required. Backed by the Bush administration, AT&T and other phone companies now want Congress to immunize them against private lawsuits for aiding and abetting the government’s illegal snooping. So far, our lawmakers are showing every sign of rolling over once again. That’s the real travesty here. Civil rights begin at home. We face a global problem. Yahoo! isn't the only problem company and the Chinese government isn't the only problem government. We need a global corporate code of conduct and global solutions. On Tuesday, Yahoo's Jerry Yang and senior counsel Michael Callahan got yelled at in congress generally for their role in the jailing of journalist Shi Tao, and specifically for failing to give complete information in their 2006 testimony about the case. The LATimes coverage of the hearing includes embedded AP video of highlights from the grilling, including Jerry Yang's apology and Michael Callahan's regretful and apologetic explanation. Also see the Wall Street Journal's very thorough account. The House Foreign Affairs Commitee website has full transcripts from Congressman Tom Lantos, Yang (PDF) and Callahan (PDF), plus a link to the webcast. All the negative attention has not been without cost to Yahoo. Its share price went down 5% on hearing day, and some reported that the hearing eclipsed the IPO of Alibaba, which now operates Yahoo's web services in China. Yahoo provided false information to Congress. Despite the sworn testimony before the Committee that Yahoo! did not know the nature of the investigation into the Shi Tao case, Yahoo! employees did know that the Chinese government wanted information related to Shi Tao because of a so-called “state secrets” investigation in order to imprison him. When Mr. Callahan later discovered that he had provided false information, he did not make the slightest attempt, not the slightest attempt, to correct the information he had given to Congress under oath. Six months after his testimony, Mr. Callahan became aware that some officials of Yahoo! did know the nature of the investigation against Shi Tao at the time it complied with the Chinese request for information. Despite Mr. Callahan’s explicit recognition that his previous testimony was inconsistent with the facts, neither Mr. Callahan nor anybody at Yahoo contacted the Committee, orally or in writing, to advise us that Yahoo had provided false information to the Committee. Inexcusably, there was no effort whatsoever by Yahoo to set the record straight after providing false information to a duly constituted committee of Congress. Mr. Callahan did, however, tell his public relations operatives to spin the Shi Tao story in a different direction. After discovering that its General Counsel had provided false information on this critical matter, Yahoo did not conduct an internal investigation into the circumstances under which false information was provided to Congress. Yahoo tried to sweep this grave transgression under the rug. No internal review of the matter took place. No change in company procedures was instituted. Nobody at Yahoo has been disciplined for providing false information to Congress. Key employees related to the provision of false information to Congress remain at their posts. Yahoo had no means or, possibly, intent, to prevent Yahoo! China from being a willing participant in political witch-hunts emanating from Beijing. Yahoo! Inc. had no American lawyers in Beijing. There was no mechanism in place for Yahoo headquarters to review Chinese efforts to ferret out individuals who wish to see a more open and democratic China. A company of Yahoo!’s resources and sophistication operating in the Chinese milieu should have taken every conceivable step to prevent the automatic compliance with a request from the Chinese police apparatus. And to this day, Yahoo! has failed to change any of its practices in order to prevent such collaboration in the future. Yahoo! Inc. is now a minority shareholder in Yahoo! China. But one of our witnesses today -- CEO Jerry Yang -- sits on the Board of Alibaba, the parent company of Yahoo! China. If Chinese police today requested information from Yahoo! China related to a political dissident, Yahoo! China would turn over the individual’s email records and identity, who might be subsequently sent to prison, perhaps for ten long years. Click here to read Jerry Yang's post titled "The Challenge of Engagement" on the Yahoo corporate blog. Some of the comments are quite harsh, though a few are sympathetic. Declan McCullagh's live blog of the event on CNet included some observations not seen much in mainstream media coverage of the story. He muses: "I wonder if Lantos and other Patriot Act supporters will apologize to Americans like Brandon Mayfield (falsely jailed under the Patriot Act) or Sami al-Hussayen (a Webmaster who provided hyperlinks to Muslim sites and was prosecuted under the Patriot Act)." And: "I wish Lantos was as enthusiastic about free speech and privacy for Americans as he is for Chinese citizens, but his record on those topics isn't great." "Update 11:10am ET: Keep in mind the background here: Many politicians simply detest China not for reasons relevant here (a brutal thuggish regime) but for unrelated ones (cheap products and its currency peg to the U.S. dollar). Others, like Smith, a Roman Catholic, are fiercely anti-China because of its persecution of religious minorities. In other words, Yahoo is being used as a convenient way to attack China for unrelated reasons." Update: 12:37pm ET: What's a little odd is that these politicians' complaints against China are true. China ranks in the bottom 10, below Somalia and just above Burma, of Reporters Without Borders' 2007 press freedom index. The odd part is that, because the committee members can't exactly get China's state security folks to show up, Yahoo is being held responsible by proxy for the content and operation of these laws. This should be a lesson to U.S.-based Internet companies: geography still matters. Be very careful when physically placing servers in an a country like China. Update 1:32pm ET: It's over, with one last speech from Lantos targeting Yahoo, but not the Communist government of China, for creating "enormous damage" to the families of those who are imprisoned. According to the Wall Street Journal account, Yang and Callahan were also asked to endorse the Global Online Freedom Act, which they said they would take another look at. I've written about why I think that proposed legislation is misguided: it is constructed as if the U.S. were immune to abuses of free speech and privacy. It also places power to decide about what constitutes legit surveillance and censorship - and what constitutes illegitimate surveillance and censorship in the hands of such esteemed bodies as the U.S. Department of Justice, known lately for its high tolerance of torture. Enough said. I am still hoping that the global code of conduct which Yahoo!, Google, Microsoft, Vodaphone, and other companies are working on with human rights groups, socially responsible investment funds and academic institutions will ultimately do more to help companies avoid becoming vehicles for rights abuses by any and all governments. But as the EFF's Danny O'Brien pointed out to the Wall Street Journal, the process has been slow going lately. There are not easy, black-and-white solutions to many of the problems, unfortunately, unless you believe in total disengagement. What did Yahoo! know and when did they know it? This document (which Dui Hua said they had examined and found to be authentic) raises some serious questions about the statement made by Yahoo! General Counsel Michael Callahan in which he said: " When Yahoo! China in Beijing was required to provide information about the user, who we later learned was Shi Tao, we had no information about the nature of the investigation." Clearly the police document proves that Callahan's statement is not 100% true. In August U.S. congressman Tom Lantos ordered an investigation of the situation. This week he concluded "Our committee has established that Yahoo provided false information to Congress in early 2006." Callahan and Yahoo! CEO Jerry Yang have now been summoned to a hearing on November 6th to explain themselves. Unless there are facts that I’m missing, for the Congress to call Yahoo! back to Capitol Hill to correct the record, in public, is completely appropriate, if “no information” is not what we were meant to understand. It may well be that what the company knew was in fact so vague, as many legal terms are in China, as to be inclusive. It may well be that someone in the company knew, but the right people didn’t know — and that an internal process was flawed in this case. But those are very different discussions, ones we should have, than the straight-up problem that the company didn’t have context for the request. One thing I don't understand is why Yahoo! isn't a bit more forthright in acknowledging that Callahan's statement and the Chinese police request don't completely add up, and that this inconsistency raises legitimate questions about what Yahoo! knew and when they knew it. Maybe their failure to address this has to do with the fact that they are also in the process of trying to get a lawsuit against them by Shi Tao's mother and others dismissed. Talking about this case to people who have spent a while working in the Internet industry in China, many think it's quite possible that communications between the local Beijing office and Yahoo headquarters in 2004 were, shall we say, sub-optimal in detail going across languages and cultures, and/or that record-keeping was disorganized enough, that Yahoo! 's U.S. legal team preparing Callahan's testimony in 2006 didn't realize that the police orders for information on email accounts for Shi Tao, Wang Xiaoning and possibly others actually did include some information about the nature of the case. It would seem pretty unintelligent to write Callahan's testimony the way it was written if one knew about those police documents, and knowing that documents have a way of getting leaked by human rights organizations - especially given that the leaking of Shi Tao's sentencing document was the reason why anybody knows about Yahoo! 's complicity in Shi's case in the first place. It's pretty rare for a company to say in public: "sorry, we messed up." And explain how. The legal risks of doing so are non-trivial. But maybe that's their best option at this point if they don't want to be accused of lying? Assuming they weren't? Yahoo acknowledged releasing personal user information about the writers to the Chinese government, but said it had to comply with the country's lawful request and therefore cannot be held liable. Its 40-page response was filed yesterday in U.S. District Court for Northern California. I have not had a chance to through them in detail yet. It would be great to know the legal opinions of any lawyers out there. Yahoo! executives say one thing in public, an official Chinese document says something else. Oops. I just discovered today that the Dui Hua Foundation, which does excellent, low-key work on Chinese human rights issues, has a blog. Last week they posted a full English translation (PDF) of a document that has surfaced recently on the web: the Beijing State Security Bureau's request to Yahoo! 's Beijing office for information about the e-mail account [email protected] That's the account used by Chinese journalist Shi Tao, who is now doing 10 years in jail for divulging state secrets. The folks at Dui Hua say they've examined the document and believe it to be authentic. If it is indeed authentic, this document would seem to clear up any lingering questions about whether Yahoo! 's Hong Kong office was involved in handing over Shi Tao's account information. Email account registration information for [email protected], all login times, corresponding IP addresses, and relevant email content from February 22, 2004 to present. So Yahoo! 's Beijing office was informed from the beginning that this was not an investigation into a potential murderer, thief, child pornographer, or terrorist, but somebody suspected of giving "state secrets" to foreigners. As Dui Hua's Joshua Rosenzweig says: "One does not have to be an expert in Chinese law to know that "state secrets" charges have often been used to punish political dissent in China." The Shi Tao case raises profound and troubling questions about basic human rights. Nevertheless, it is important to lay out the facts. When Yahoo! China in Beijing was required to provide information about the user, who we later learned was Shi Tao, we had no information about the nature of the investigation. Indeed, we were unaware of the particular facts surrounding the case until the news story emerged. Law enforcement agencies in China, the United States, and elsewhere typically do not explain to information technology companies or other businesses why they demand specific information regarding certain individuals. In many cases, Yahoo! does not know the real identity of individuals for whom governments request information, as very often our users subscribe to our services without using their real names. Read the full testimony here (PDF). Now we know that when Callahan said "we had no information about the nature of the investigation," he was not telling the truth. What Yahoo! China's employees in Beijing might have done differently without getting themselves in trouble is an open question. Still, the fact is that Callahan did not tell the truth to Congress. Was he was deliberately lying? Or are Yahoo! 's internal communications and record keeping just so bad that he didn't have full information from the Beijing office? That makes me wonder: what else did the Beijing office do - or have knowledge of in relation to the case of Shi Tao and others who are now in jail - which Yahoo! execs are keeping mum about... if they even have any idea themselves?